The Diamond Edge SB-1 is driven by Bowtech’s famous Binary Cam System, which produces more consistent timing and makes tuning easier. How did it perform in our tests? Bowhunting World doesn’t often test youth bows (and I’ll address the accuracy of that label later on), largely because they rarely go up to the IBO standard 70-pound draw weight and 30-inch draw length that allows for an apples-to-apples comparison. Even subjective qualities are difficult to assess when a shooter accustomed to a 60- or 70-pound draw weight and a 29- or 30-inch draw length tries to shoot a bow with a 25-inch maximum draw length and a 40-pound maximum draw weight. In the case of the Diamond Edge SB-1, these are not issues because it tops out at 70 pounds and 30 inches, despite the fact that it goes all the way down to 7 pounds and 15 inches. 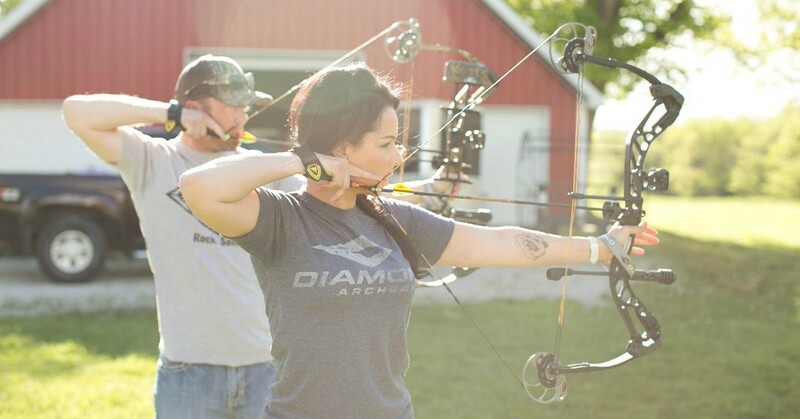 Diamond Archery takes advantage of the technology developed by sister company Bowtech to produce bows that offer some high-end features at a moderate price. In general, Diamond bows are relatively compact, lightweight, user-friendly and versatile. Specifically,the Edge SB-1 ($449 w/R.A.K. Package) is driven by Bowtech’s famous Binary Cam System, which produces more consistent timing and makes tuning easier to achieve and maintain. Comparisons with Diamond’s similarly named and similarly versatile Infinite Edge seem unavoidable, but in reality it’s a different bow altogether — different riser, different limb pockets, different grip. And while similar in terms of extreme versatility, the Edge SB-1 is, if anything, easier to set up and tune. With a few Allen wrenches, anyone can adjust the draw weight and length. Draw-length settings are even etched onto the modules, as opposed to an A, B, C code or other symbols, and the EZ Adjust limb-pocket system actually displays maximum and minimum settings. As long as we’re comparing the Infinite Edge and the Edge SB-1, we can point out that the Edge SB-1 is slightly heavier than the Infinite Edge (although still very light at 3.6 pounds) and has limbs that are closer to parallel. Both features offer some advantages we’ll take a look at. If the emphasis on versatility and user-friendly features creates an image of a cheaply made “kids' bow,” that is an inaccurate image. The Edge SB-1 is a bow any hunter might lift off the rack for a closer look, and only upon closer inspection of the draw-length settings might he suspect this is a bow suitable for aspiring young hunters. Axle to axle it’s a fashionably compact 31 inches, with a 7-inch brace height. In addition to the Bowtech cams it features Octane strings and a ready-to-shoot package including Apex and Octane accessories. The test model in Mossy Oak Break-Up Country looked sharp; the discreet silver-and-black Diamond logos on the grip and riser class it up a little, while the limb pockets that cover the limb bolts make for a sleek appearance. Fit and finish are as durable and flawless as on any flagship bow. The test bow came ready to shoot out of the box and was tested with the R.A.K. accessories. I played with the draw-weight and draw-length adjustments; they are indeed as easily adjusted as billed, and I encountered no chattering or sticky bolts or screws. Accurate as assembled, I tweaked it slightly to get bullet holes through paper and was immediately getting groups under 1.5 inches at 20 yards. At 3.6 pounds this bow is decidedly on the light side. There are lighter bows, to be sure, though none I’m aware of with the quality and versatility of this one. Arguably a little weight contributes to holding the bow steadier at full draw and makes it more pleasant to shoot. I found the grip comfortable enough and probably a little warmer than a side-plate-style grip. The Apex sight includes a level and an aperture for a sight light, which is not essential but which I’d recommend if the bow is to be used in a ground blind. I’m a fan of drop-away rests, but the Octane Hostage Max rest on this bow is a good rest; it's particularly well-suited for young or beginning hunters, since there is little to go wrong here and no timing issues to be concerned about. Yes, the brushes will wear over time, but these are easily replaced when necessary. I found the back wall adequately firm, if not rock solid, despite a lack of cable or limb stops. These cams do draw smoothly. At the shot, the bow moves very little even in a loose grip, and there is a detectable but only slight amount of vibration. No doubt the nearly parallel-limb construction contributes to both qualities. Despite that design feature, noise levels are a little above average by current standards; some LimbSaver or Axion dampers on the limbs might reduce that a little. It’s worth pointing out that Diamond has developed a dedicated website specifically for help with tuning this bow and keeping it in tune, including some shooting tips. Experienced shooters probably won’t need the site, but it’s a great resource for youngsters or beginning bowhunters. Which leads us back to the question posed earlier regarding the appropriateness of labeling this bow a youth bow. Certainly the Diamond Edge SB-1 is a bow any young or beginning bowhunter can be proud to carry, and its versatility, user-friendliness and relatively moderate cost make it ideally suited to that market. On the other hand it looks great, shoots great, maxes out at 30 inches and 70 pounds, and, with the right arrow and broadhead, is capable of killing a bull moose or any other North American big-game animal in its sights. Bottom line: I’d hunt with this bow any time, anywhere, with confidence. For more information, call (877) 901-1934 or visit www.diamondarchery.com.